Sadik Kwaish Alfraji (b. 1960), a page from Ali’s Boat 1. Indian ink and charcoal on notebook paper, 2014. © Sadik Kwaish Alfraji. Reproduced by permission of the artist. The Moving stories display tells the story of the long history of human migration through three very different elements; a projection of the million-year-old Happisburgh Footprints, the contemporary artist book and prints of Ali’s Boat by Sadik Kwaish Alfraji (b. 1960) and the film Édouard Glissant: One World in Relation focusing on the philosophy of Édouard Glissant (1928–2011). This display came about through a number of conversations with the Museum’s Director, Hartwig Fischer, focusing on how the Museum could respond to contemporary events. Sadik Kwaish Alfraji (b. 1960), pages from Ali’s Boat 1. Indian ink and charcoal on notebook paper, 2014. © Sadik Kwaish Alfraji. Reproduced by permission of the artist. HW: When the project team first discussed the theme of migration as a focus for this display, we wanted to select objects from across the Museum to represent elements of this vast experience. I spoke to you, Venetia, at that point to try and find objects that could talk about the emotional experience of migration. 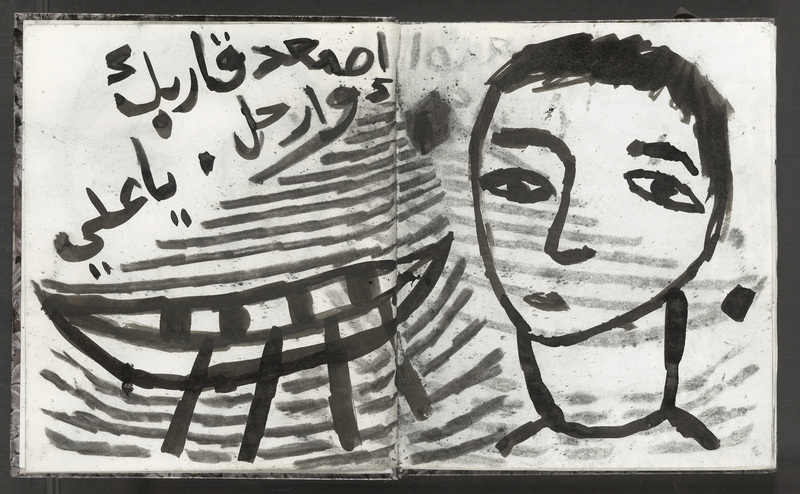 One of the objects selected by the Director was Ali’s Boat an artist’s book by Sadik Kwaish Alfraji. When did you first encounter Sadik’s work? VP: We acquired Ali’s Boat in 2015, I had heard about Sadik’s work before, but I was mostly familiar with his videos and so when I found out that these were based on drawings and artist books I wanted to learn more. When I saw Ali’s Boat I fell in love with it immediately, it felt like a really appropriate acquisition. All of Sadik’s work is bound up in his own history, his relationship with his country, his past and his family – it’s so personal. As well as being existential and universal. That is what is magical about this book. It is drawn in a childlike way, and emphasises the fragility of the subject. When we first spoke about the Moving stories display in February 2017, Sadik and I had actually just reconnected. He is included in the Ruya Foundation’s Iraq Pavilion at this year’s Venice Biennale and I was writing an essay about the work he is presenting there. Then when the Director asked if we could display the work as a set of prints as well, I contacted Sadik and his gallery, Ayyam, directly to ask about their availability. HW: The entire display was produced in a very short time frame. It felt like such an urgent topic for us to discuss, and it is relevant in so many different ways. You discussed the universality of Sadik’s approach to his art, is there a key element of the work that you wanted to highlight in this display? VP: What is so poignant about this work is that it is a meditation on the theme of migration and exile… It’s very sad actually. Sadik left Iraq in 1990 and returned for the first time in 2009. The book is inspired by a letter from his nephew Ali. ‘The morning I left Baghdad, he handed me a sealed envelope, which he asked me not to open till I returned home to the Netherlands. 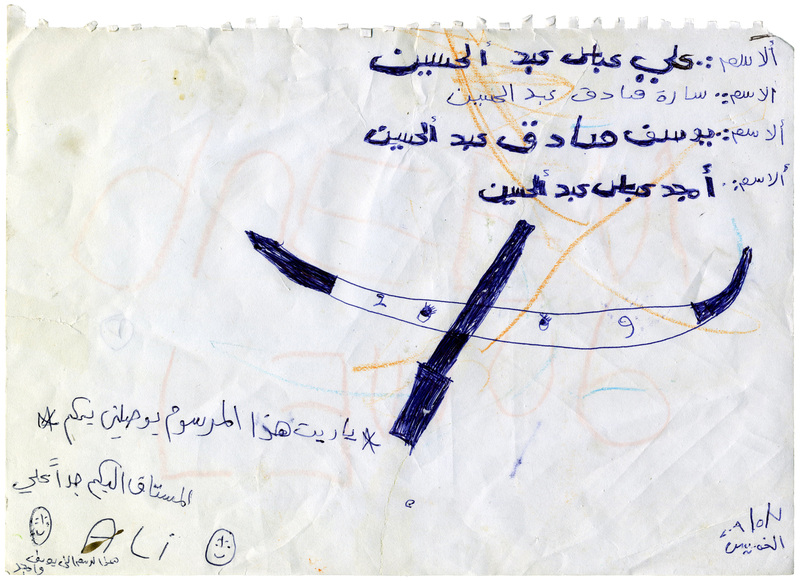 Ali’s note with the drawing of a boat that inspired his uncle, the artist Sadik Kwaish Alfraji, to create Ali’s Boat diary five years later. © Sadik Kwaish Alfraji. Reproduced by permission of the artist. HW: It’s an incredibly moving art work, and we were able to compare it with two other journeys within the display; the Happisburgh footprints, and the film One World in Relation of the poet and philosopher Édouard Glissant. Nick Ashton, Curator for Palaeolithic Collections, explained that ‘Happisburgh tells of a metaphoric journey where people have crossed the natural boundaries of their known world. It is a story of survival in a harsh environment, but also one of opportunity.’ Glissant too talks about these same experiences in One World in Relation, and it is not only the trauma of diaspora communities but also the transformations that occur that link all three together. VP: Exactly. Sadik’s story is so personal, it’s about one person and yet it’s also an allegory. It speaks to the footprints and the deep history of human movement, and that same hope. On Saturday 22 April 2017, 11.00–16.00 there will be free drop-in performances and activities inspired by the themes in the current Asahi Shimbun Display Moving stories: three journeys. Activities include a workshop led by artist Sadik Kwaish Alfraji. 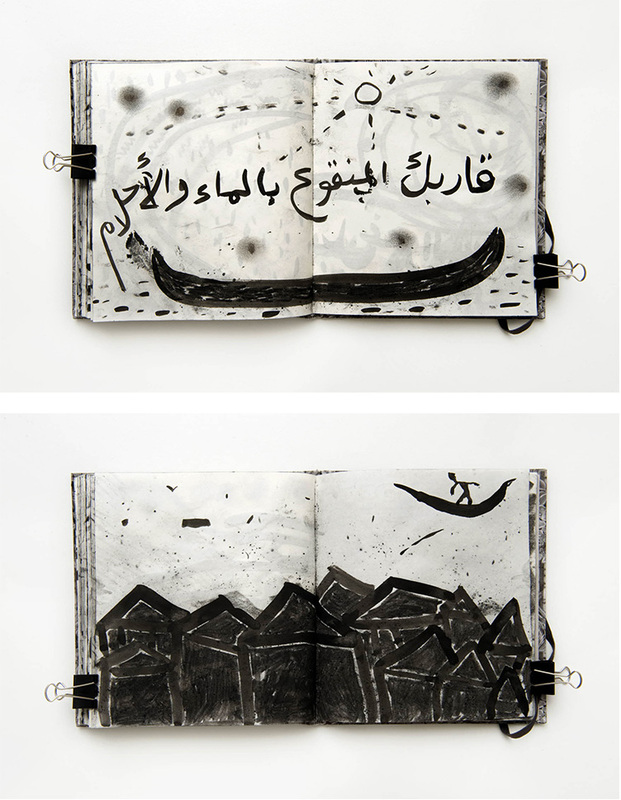 The acquisition of Ali’s Boat, the artist book and prints were supported by the Contemporary and Modern Middle Eastern Art acquisition group (CaMMEA) and the Brooke Sewell Permanent Fund.